Mezco Releases New Zombie Living Dead Doll Image! When there is no more room in hell, dolls will walk the Earth. The 22nd series of the Living Dead Dolls, pays tribute to the creatures that first inspired the creators more than a decade ago: Zombies! Five rotting corpses, freshly reanimated, shuffle forth from their tombs and into the night. They search for brains…try to be open minded! Set of 5, each individually packaged in their own coffin…for now. Comments: Comments Off on Mezco Releases New Zombie Living Dead Doll Image! 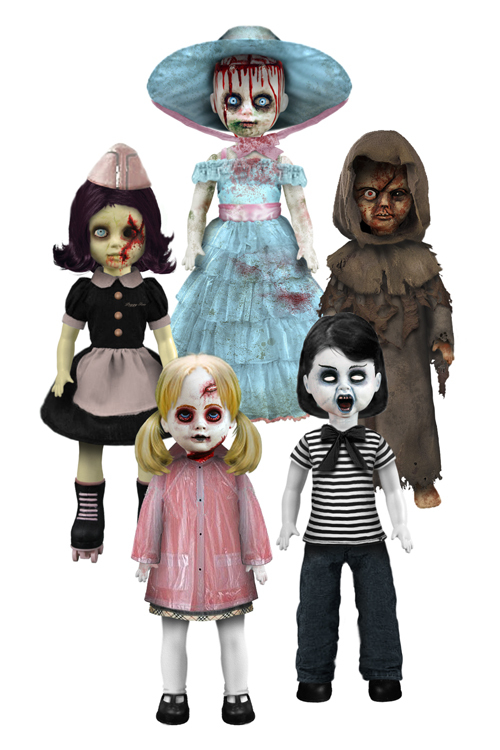 What started as a late night endeavor in the bowels of New Jersey, has grown into the world’s best selling and longest continually running line of collectible, horror-themed specialty dolls. 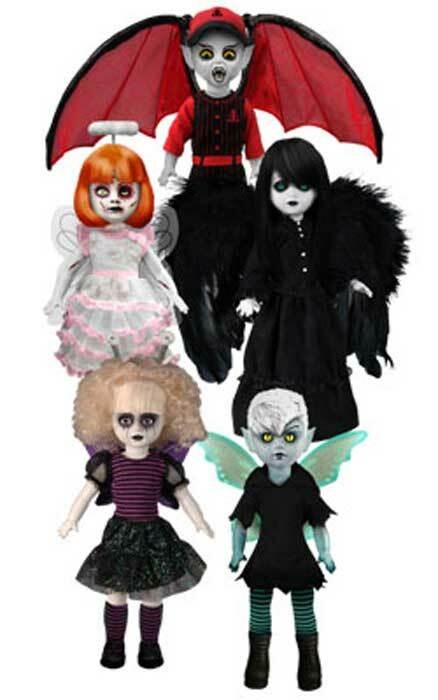 In addition to over 20 regular series and more than12 series of Living Dead Dolls Presents, the Living Dead Dolls have successfully been translated into dolls, mini figures, plush, board games, trading cards, apparel, barware and costumes. Mezco Reveals Living Dead Dolls Series 21: Things With Wings! And so the celebration of the 13th anniversary of Living Dead Dolls has begun. Set of 5 dolls ships in mid-May 2011. Comments: Comments Off on Mezco Reveals Living Dead Dolls Series 21: Things With Wings! This exclusive variant set features Nohell dressed for the season in a festive blood red, velvet touch holiday dress with white faux fur trim and real jingling bells on her boots. This variant also features coal black hair and “frozen” blue lips. 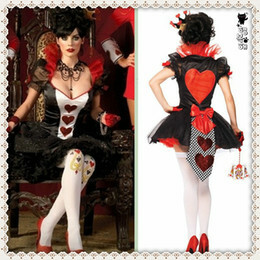 Making this exclusive limited edition extra special is the inclusion of an item that will make Living Dead Doll collectors scream with delight; a luxurious raven black stocking decorated with a festive crossbones of a skull and candy canes, perfect for gifts of coal for naughty boys and girls. The stocking features festive faux fur that coordinates with that on Nohell’s dress, and a hidden loop for hanging on the mantle with care. Nohell is 10inches tall, and is packaged, with the stocking, in a special snow white colored coffin. Limited edition of 666 pieces. Ships in late November 2010. In the spirit of Halloween, Mezco’s latest set of Living Dead Dolls pays tribute to the skeleton filled holiday known as The Day of the Dead or El Día de los Muertos. The variant series features intricate skull designs and exclusive crimson and black elaborate costumes, depicting traditional imagery with a Living Dead Dolls twist. 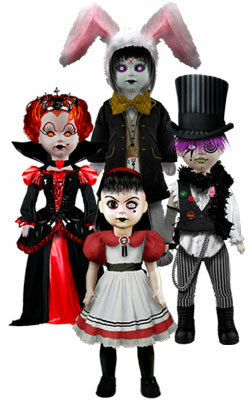 Each doll comes in a signature coffin package with death certificate. Mezco unveils its best Halloween treat ever: Three retro Halloween-themed boxsets that include an old school-styled plastic mask, exclusive 10″ doll and a coordinating T-shirt (XL only). 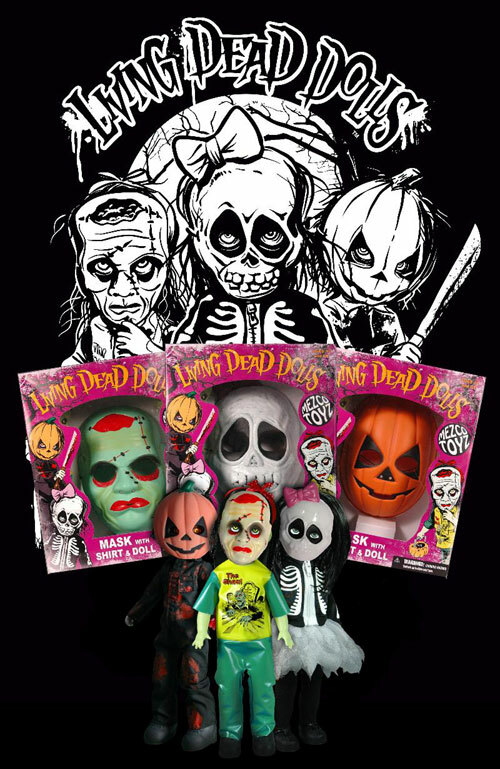 The trio consists of three of the most popular Halloween Living Dead Dolls ever created: Calavera The Skull, Pumpkin – The Jack O’ Lantern and Gabriella – The Ghoul. Each set harkens back to your favorite childhood Halloween memories with an adult-sized plastic mask with elastic straps, cut-out eyes and mouth hole; a limited edition exclusive Living Dead Doll with glow-in-the dark mask that coordinates with the set; one exclusively designed extra large tee shirt by Dave Cook and packaged in a fantastic retro-style Halloween costume window box. 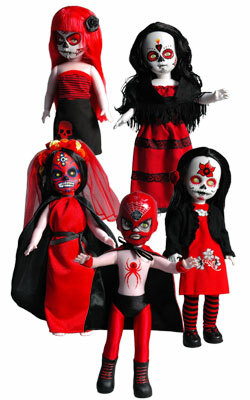 Choose from: Calavera – The Skull, Pumpkin – The Jack O’ Lantern and Gabriella The Ghoul. Limited to 500 pieces of each set, worldwide. These are sure to go fast and become a super-rare prized addition to any collection. The latest addition to the ever-expanding Living Dead Dolls line is Nohell, dressed for the season in a festive red and white holiday dress with real bells on her boots and removable hat. This 10inch tall Living Dead Doll comes in a specially colored coffin and has a removable holiday hat. 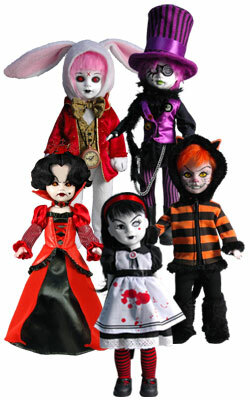 …continue reading Living Dead Dolls in Wonderland Cheshire Cat Released! Comments: Comments Off on Living Dead Dolls in Wonderland Cheshire Cat Released! 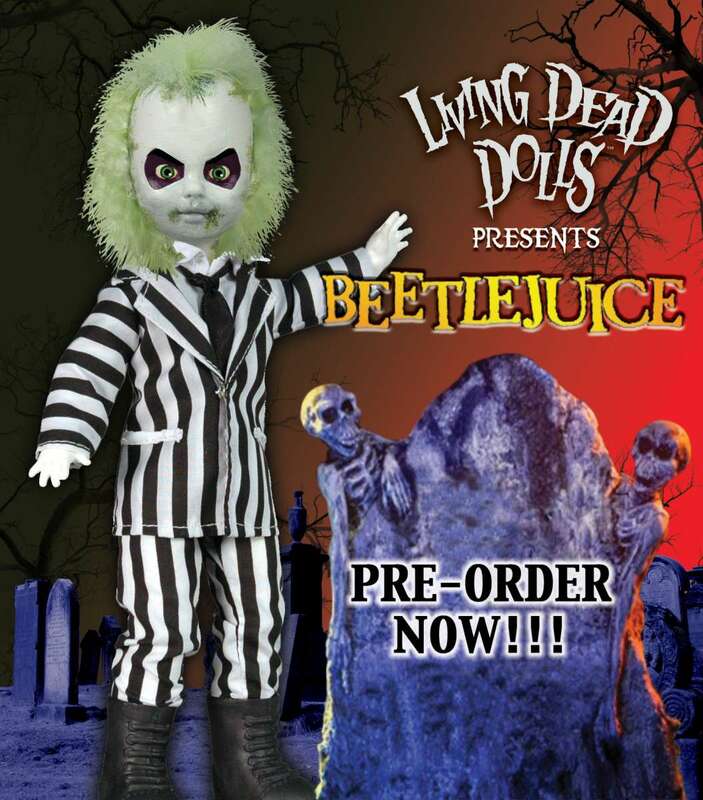 Living Dead Dolls Presents: Beetlejuice! Beetlejuice stands 10 inches tall and comes with film-accurate removable cloth costume. Packaged in a collector friendly fifth panel window box. Ships in late May/ early June 2010. Available for pre-order now at MezcoDirect.com and other fine retailers! Comments: Comments Off on Living Dead Dolls Presents: Beetlejuice! Each comes packed in their own window box are are expected in stores in February 2010.